Artistic collaborations lead to many strategic benefits. They can make a lesser known creative group more visible, expand the potential audience base, secure additional financial resources and fine-tune longer term objectives for organizations that must prove their relevance in a community. Most importantly, they can lead to a unique performing and creative moment on the stage. Sometimes collaborations are a struggle that can compromise the end result and the strategic value – disagreements about creative decisions, ego differences and the absence of sincerity or heart in the enterprise. But, there also are collaborations that occur so naturally and effortlessly that even before the public performance there is that rarefied joy of harmony and honesty in the creative endeavor. 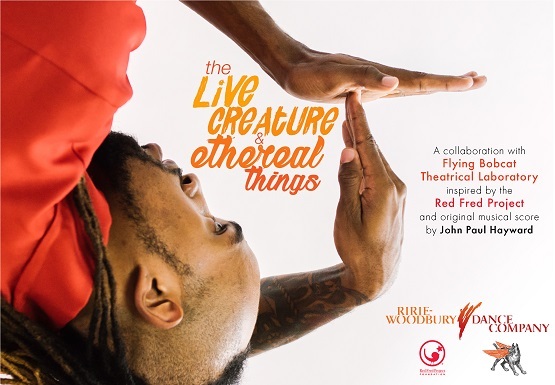 Watching a recent rehearsal of Ririe-Woodbury Dance Company artists with guest performer Robert Scott Smith for the upcoming concert the live creature and ethereal things, it was evident how that rare sense of artistic satisfaction already had permeated this unique collaboration. Magic, humor, love, innocence, purpose and indomitable spirit were present. Typically the middle show of Ririe-Woodbury’s season is a family-oriented concert, sandwiched between more dramatic performances of new and historic dance repertoire. With the storyline guidance of the Flying Bobcat Theatrical Laboratory and an original musical score by John Paul Hayward, this year’s edition focuses on bringing to life in dance the characters of the Jolly Troop that form the core of the Red Fred Project, which Dallas Graham founded. Daniel Charon, Ririe-Woodbury’s artistic director, and the dancers are choreographing the work. The concert will not be an adaptation nor an interpretation of a specific book of the Red Fred Project. Rather, it is the creative realization of the Jolly Troop characters that appear variously as friends in the stories the children want to tell. In printed form, they are birds created with punctuation marks – including commas, exclamation points, periods, and a modified less-than sign. But, as characters, they become complex beings with desires, emotions, determination, pain, struggles, joys, opinions and passions. From the vantage of Red Fred, a child is not defined by limitations of illness or disease but of a life filled with passions, anticipation and adventure that animates that child’s heart and soul like any other. In 2016, Smith and Alexandra Harbold from The Flying Bobcat Theatrical Laboratory worked with Graham, playwright Troy Deutsch and the Salt Lake Acting Company to adapt Climbing With Tigers for a theatrical production. It was a tricky logistical effort that mixed live stage acting with animation to represent the Jolly Troop birds and recorded voices for their characters. The show was warmly received locally. 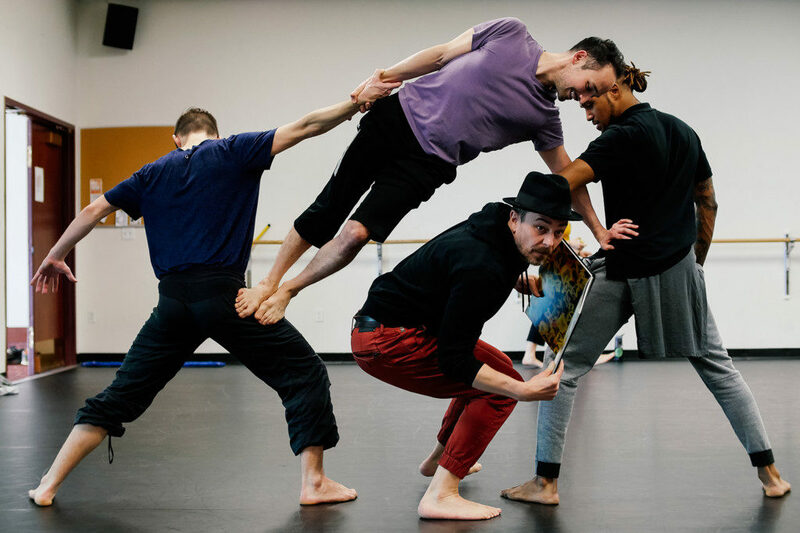 Dance affords a story-telling opportunity of limitless imagination, given the expansive repertoire of movement languages and vocabularies upon which choreographers can offer to Smith, Harbold and Graham, who are responsible for the literary aspects of the collaboration. With plenty of props on hand, Smith on stage is joined by the dancers (Yebel Gallegos, Melissa Younker, Megan McCarthy, Bashaun Williams, Breanne Saxton and Brian Nelson) who inhabit and animate the Jolly Troop characters with movements, eye contact and facial gestures that respond directly to Hayward’s imagistic musical score. Text is spoken in English and Spanish. 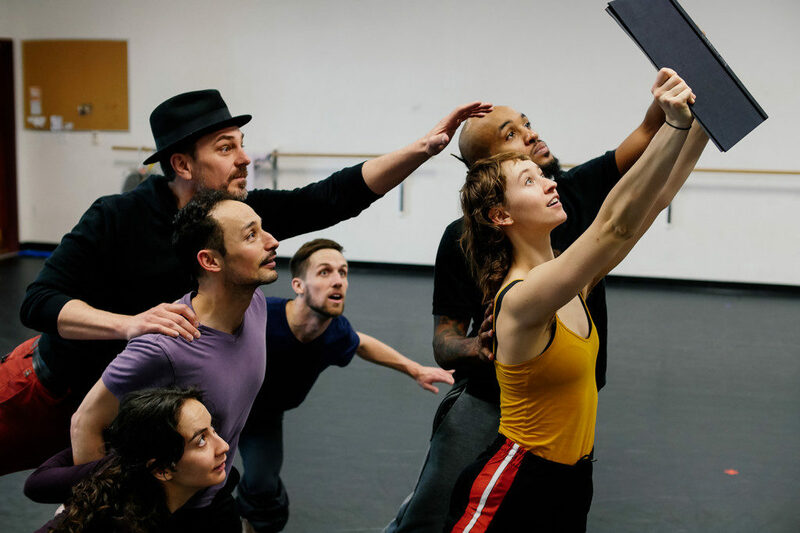 It is a choreographic journey that is immediately approachable and identifiable to its audience members, regardless of age. 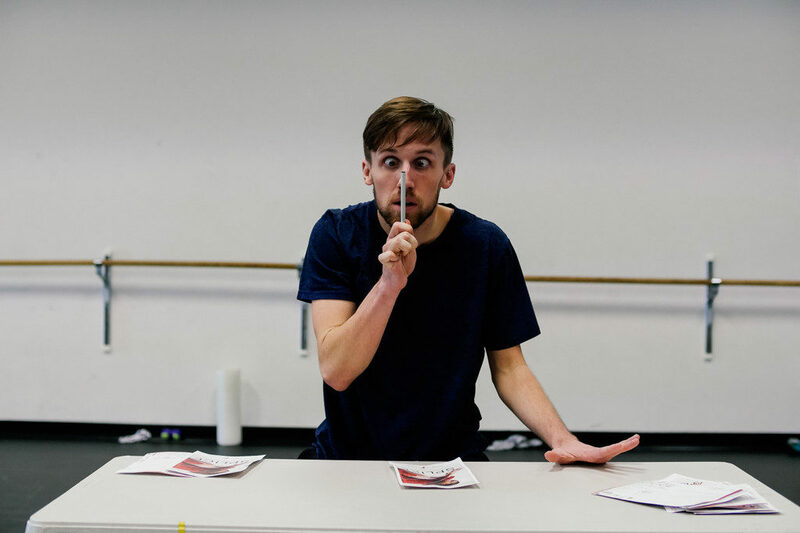 Charon explains that the dancers have involved themselves extensively in the choreographic process, adding movements and gestures – sometimes spontaneously – to flesh out the Jolly Troop characters which they are performing. Smith explains that everybody in the creative process has recognized and “honored the core of Red Fred,” adding that he feels less as a guest artist than as a performer who has been welcomed and fully integrated into the artistic community which the dancers inhabit. Indeed, it’s a concert that promises to unlock the inner child sense that really never leaves our souls. Performances will take place at the J. Q. Lawson Capitol Theatre in downtown Salt Lake City on Friday, Feb. 1, and Saturday, Feb. 2, at 7:30 p.m. with a Moving Parts Family Series matinee on Feb. 2 at 1 p.m. Ticket information is available here. Support for the concert also is provided by Mary Jane O’Connor, the Price Family Foundation and Zions Bank. The music was commissioned by the Charles and Joan Gross Family Foundation.